An Earth Turning Slowly is… an Undum parser game? A choice-based game with partially hidden choices that you access by typing? The parallel-universe anti-twin of Jon Ingold’s The Colder Light? Here’s how it works: you type the beginning of a command. AETS supplies a menu of possible completions for the command that are currently valid. If you type something that’s not on that menu, you can’t submit it, so there’s no need for actual parser error messages: you never get as far as submitting a malformed command. I’m fairly sure this isn’t doing most of the work your classic parser has to do, as far as breaking up sentences and looking for objects in scope and matching against them; I don’t get the impression that there’s that much of a world model under the surface. The menu is making up for that work, because it pattern-matches the beginning of a valid command and then helps you complete that command in the one way that the game is actually designed to understand. So for the author, there’s less error-message-writing and bad-entry-handling to do; for the player, there’s less opportunity to get caught in guess the verb/noun situations. The effect of the system isn’t just to eliminate problems, though: the menu also comes with a sentence or two describing why your protagonist might be considering that particular action, which gives it some extra context. This is all quite nifty. 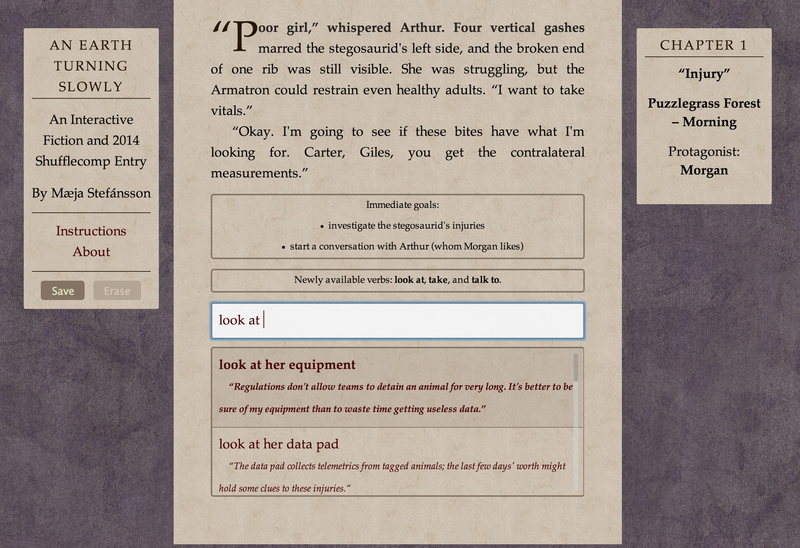 I really liked having Undum’s attractive presentation associated with a parser game. It feels so elegant. I think there’s possibly a bit more infrastructure around the command line than is strictly ideal — a lot of the page is taken up telling you what you’re trying to do and what you could possibly type — but I think this could be tweaked. (And I don’t dislike it as it stands; I’m just tempted to streamline a little.) Those who are at all interested in the ongoing discussions and debates about parser/choice game UI really really should give it a look, and I hope that the author will choose to share the code or make a tool available after the competition. This entry was posted in interactive fiction, Reviews, user interface and tagged shufflecomp by Emily Short. Bookmark the permalink. (I was a beta-tester, fwiw). One of things I liked about the interface was that it meshed so well with the characterization; it led to a feeling of discovery with how these characters interacted and thought about each other, which seemed partic. important in a game with such a close knit, highly specialized unit working together. This is really amazing and fascinating work, especially for something the author’s first IF (according to the credits). I had some UI nitpicks concerning the number of clicks it takes sometimes (sometimes it felt like type, scrolll, click, scroll, click) but actually I think the real issue I was having is that the suggestions appear below the text box, which is usually at the bottom of the browser window. Sometimes I missed a parser, when I wanted to type “look at bites” when only “look at the bites” is accepted, but that may be old parser reflexes; it’d be really something to see a parser embedded in a system like this. But this is all nitpicky — this is really something, especially for something that had to be made on short notice. Actually there exists a Russian IF platform that uses the same pseudo parser engine. It is called metaparser. It’s not online but rather a classical desktop application. Russian language creates additional challenges even for a simplistic parser like this – words in Russian language are active grammar elements and change their form depending on the structure of the phrase – and in order to deal with it an engine uses a built-in vocabulary with all the word forms in order to resolve them automatically. But other than that it is very, VERY similar to what Undum has implemented – the same autocomplete principles, objects and actions that appear as you type and so on.